Would you like to write for VandyPride? We are always looking for loyal Vandy fans to contribute and can help set up interviews for articles. Contact Allen@VandyPride.com if you would like more info. Scott, thanks for taking the time to talk to us today. Tell us what you’ve been up to. I’m currently a high school principal in Northern Kentucky and I’ve been doing this for almost five years now. I was coaching but I’m no longer coaching now. I’ve got three kids and I coach every single one of their teams. So as you can imagine it’s been a busy winter. Who or what inspired you to get into teaching? After College I went to Law School at Vandy, and I am currently working at a law firm in Phoenix, AZ. Why did you choose Vanderbilt? I’m sure you had other schools pursuing you. I chose Vandy because it offered me the best of both worlds in the sense that it had great academics and gave me the opportunity to play basketball at the highest level. When I took my visit and saw a home game versus South Carolina and there were 13,000 fans, I knew this is where I wanted to go. Where was the toughest place to play? I would say the toughest place to play would be Kentucky. Not so much because of the fans but because their teams were extremely talented while I was there. Who was the toughest player to guard? What have you been up to? I heard you were playing basketball overseas. Yes. When I was released by Philly in late October, I signed with the Koln 99ers in Cologne , Germany . After several problems there, I left the organization. Since then, Iâve been playing in France for the defending French League champion Chorale-Roanne since late January/early February. Currently, I am preparing for the playoffs here and honing my skills. When you decided to transfer from Viriginia why did you choose Vanderbilt? I understand you are an assistant coach at UAB. How did you wind up there? I have been friends with Coach Mike Davis since he was the coach at Indiana. He had an opening on his staff last Spring and invited me to come down to Birmingham to talk about it and he offered me the same day. What would you have done if UAB played Vandy in the NCAA tournament this year? Calling in sick isn’t an option. I would be excited because both teams wold be fortunate to have made the field of 65! I would have mixed emotions until the game starts and then I am coaching to win. Is it your ultimate goal to be a head coach one day? I would love to coach at an NCAA Institution. That is my ultimate goal. I have been a head coach at the High school level and I loved that experience. How did you get into coaching? It was something when I was a player that win the back of my mind. When I graduated there was a coaching change. Coach Fogler left as I was graduating and I had a opportunity to join the new staff Jan’s first year. I got a taste of it at the collegiate level there. From there I ventured into the private sector and worked in the software business for a while. But I never gave up the idea of coaching. I coached a few middle school teams along the way and eventually decided I wanted to give the coaching thing a shot and was fortunate enough to land a high school job here at MBA. I’m finishing my fifth year here. It’s something I’ve always wanted to do and I’m lucky to get to do it. Who or what inspired you to coach? How nice was it catching up with the class of 89 at the 20 year reunion? It was fun. We had a really good time. We try to stay in touch as best we can. Seeing them all together was fun. Are some of those guys harder to stay in touch with that others? I hear from Barry Goheen and Booker more than some others. Frank Kornet is a long way away. You played baseball in college didn’t you almost go pro? I did play baseball when I was coming out of college. I signed a contract to give up my last year of eligibility. Do you ever think about what could’ve been if you stuck with baseball? Now that you graduated are you going to pursue professional basketball overseas or are you planning to do something else? I have signed a contract to play pro in England in the BBL. Guildford Heat, based about 40 minutes outside of London won the playoffs last year. So I hope to go into a team and help them regain their title. What are you most proud of from your time at Vandy? 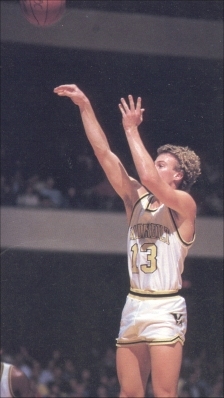 Being part of a graduating class that changed the way college basketball critics look at VU basketball. Who was the toughest player to guard? Where was the toughest place to play? I’ve been over here in China for the past month. Our season started two weeks ago. Who are you playing for? The teams here aren’t specific to a city. I’m with Fujian SBS Basketball team. SBS is a zipper company that makes 80% of the zippers in the world. The owner of that company owns the team. Is your family there with you? Unfortunately she’s not. I get a break in a few weeks so I’ll come back to Nashville. We talk a lot on the phone and do a lot of chatting on the internet. What do you do for fun over there? I watch my Slingbox, that’s about it. It’s not bad. They put us up in a nice hotel but the langauge barrier makes it difficult. Have you learned any Chinese? Barry, how did you get into broadcasting? Well, I stumbled into it actually. I did a couple of things on local TV with Rudy Kalis in the 1993 season. 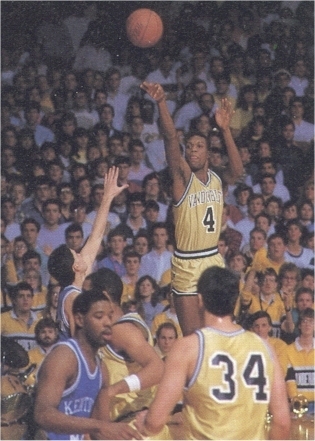 Vandy was the SEC champs and they had a game against Memphis that channel 4 broadcasted and Rudy asked me to do that. I also did a little postseason thing with them too. Some folks in Nashville recommended me to Jefferson Pilot and now Raycom. Coach Fogler I know was one of those that made the recommendation. Those guys picked me tup and here I am 15 years later. When calling the games is it hard to stay impartial being a Vandy alum? Do you ever get caught up in the game as a fan? Bruce thanks for talking to us what have you been up to? Well, I just took a new job back in the fall. I’m working for a small consulting firm that does assessments for investors. It’s a new career for me. Before that I was working in operations and development for health care companies since I left the MBA program at Vanderbilt. 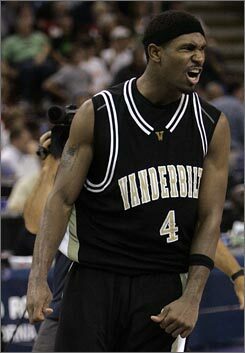 Speaking of Vanderbilt, what led you to transfer from Davison to Vanderbilt?